Google Authenticator is an alternative to SMS for 2Step verification, installing an app on Android where the codes will be sent. It works without any connectivity; it even works on plane mode. This is what I don't get. How is it possible that it works without connectivity? How do the mobile phone and the server sync to know which code is valid at that very moment? Google Authenticator supports both the HOTP and TOTP algorithms for generating one-time passwords. With HOTP, the server and client share a secret value and a counter, which are used to compute a one time password independently on both sides. Whenever a password is generated and used, the counter is incremented on both sides, allowing the server and client to remain in sync. TOTP essentially uses the same algorithm as HOTP with one major difference. The counter used in TOTP is replaced by the current time. The client and server remain in sync as long as the system times remain the same. This can be done by using the Network Time protocol. 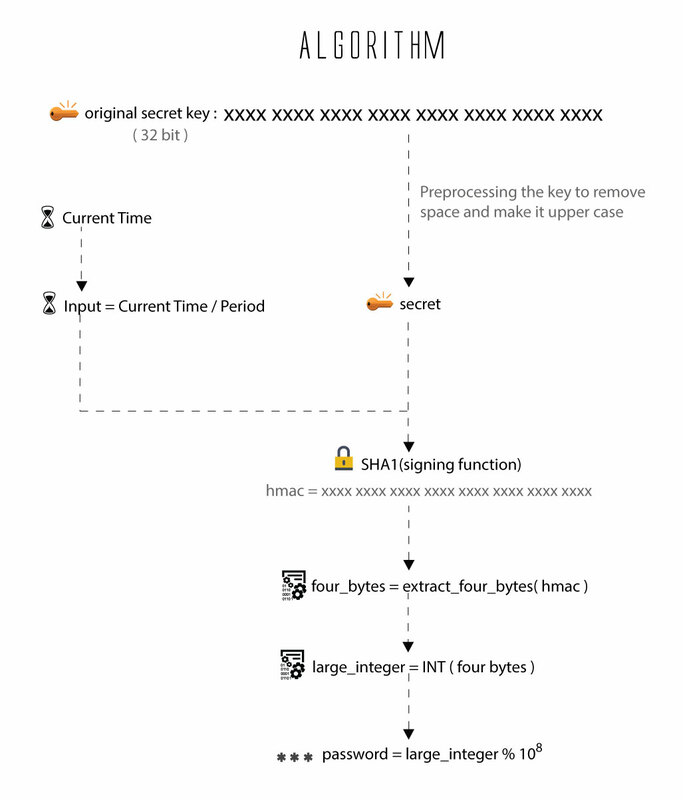 The secret key (as well as the counter in the case of HOTP) has to be communicated to both the server and the client at some point in time. In the case of Google Authenticator, this is done in the form of a QRCode encoded URI. See: KeyUriFormat for more information. Shared Secret : The shared secret is what you need to obtain to set up the account on your phone. Either you take a photo of a QR code using your phone or you can enter the secret manually. Input (Current Time) : The input time value you'll simply get from your phone, no further interaction with the server is required once you have obtained the secret. However it is important that your phone's time is accurate as the server will essentially repeat what happens on your phone using the current time as known by the server. Signing Function : The signing function used is HMAC-SHA1. HMAC stands for Hash-based message authentication code and it is an algorithm that uses a secure one-way hash function (SHA1 in this case) to sign a value. Using an HMAC allows us to verify authenticity - only people knowing the secret can generate the same output for the same input (the current time). It'll work on a seed based on time so it's similar to the way the RSA key fobs work. i.e. they also don't require any connectivity. The mobile phone already knows it; you scanned it via QR or typed it in. Not the answer you're looking for? Browse other questions tagged authentication passwords cryptography google one-time-password or ask your own question. Why does Google Authenticator have different codes on different devices? Can Google's administrators be trusted with Google Authenticator? What is the use of the “secret” displayed when setting up 2 Factor Authentication? How Google Authenticator in Android mobile identifies this is the right SSH server? Which telephone numbers do Google use for Two factor verification codes?